Search as you might, you’ll never find a farmhouse quite like this one! From the exterior design to the interior comforts, this home has a unique style that gracefully combines art and utility. 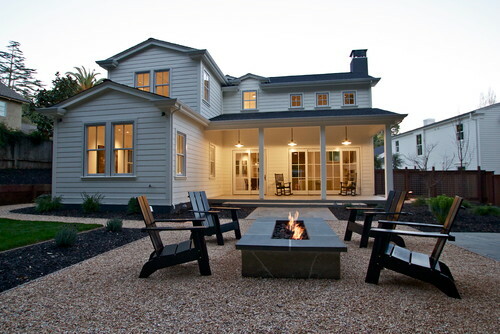 The outside has all the hits, including a spacious porch and perfectly-crafted fire pit. The interior has elegant furnishings, stylish appointments, and a fireplace with a rising chimney that dominates an entire section of the house. From the moment you visit this contemporary farmhouse from KCS, Inc., you’ll realize that you're seeing something truly magnificent! 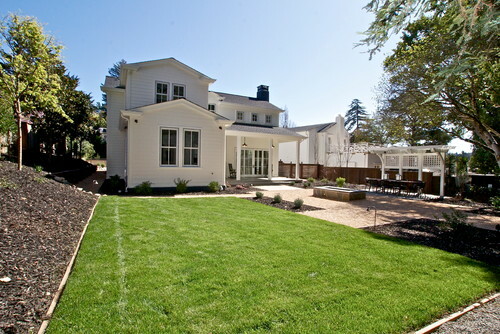 The exterior of the home is highlighted by a pristine lawn, crisp landscaping, and a corner porch that provides shade and comfort to any visitor. The porch looks a bit small from a distance, but as you approach, you can see that there is plenty of space for relaxing with some fresh air. 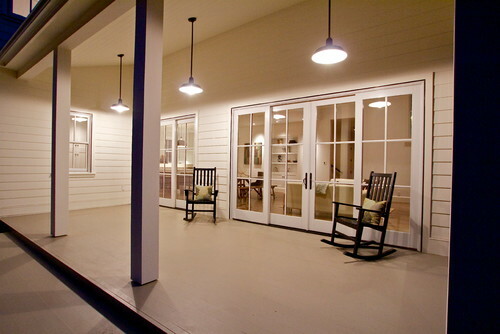 The rocking chairs give the porch a classic farmhouse appeal as well as a place for rest and comfort. One of the most stunning areas in the home is the living room. The obvious highlight is the large wood structure that rises along the chimney. 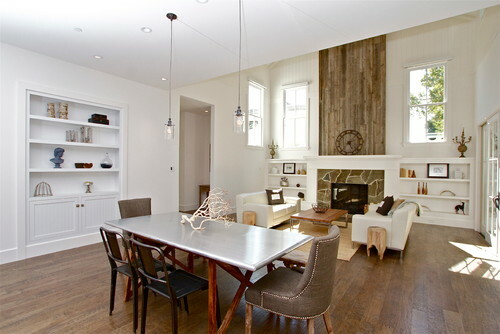 With a natural stone foundation, the entire fireplace has a rustic yet contemporary charm. The kitchen has a quaint yet modern appeal, thanks in large part to the bright white cabinets and countertops. 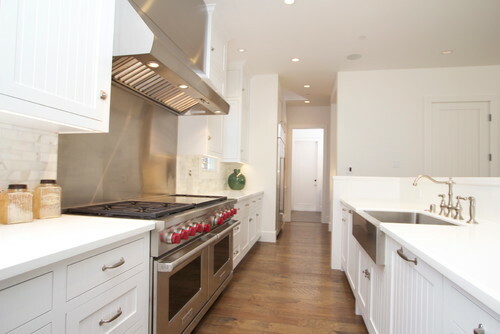 With stainless steel appliances and a large sink, the kitchen has utility as well as beauty. The dining table, which sits just outside the living room, has a natural appeal and provides a great view of the rising chimney structure. With light, neutral colors for its decorations and clear white walls and ceiling, this bedroom appears comfortable and relaxing. 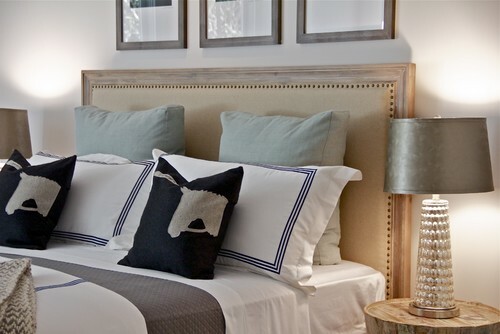 The horse-print throw pillows maintain the country charm of this farmhouse. Unlike many contemporary country homes, the bathroom does not stray from the rustic charm. 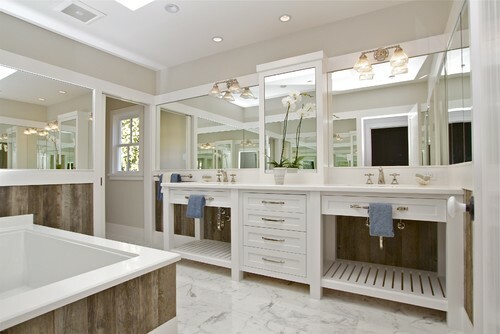 The combination of natural wood and white cabinetry works perfectly together. With a warm fire and a comfortable Adirondack chairs, the outdoor fire pit is perfect for passing an evening with the best of friends. What do you think of this incredible contemporary farmhouse? Would you like to spend an evening relaxing in this home? Share your thoughts with us today!